At this year’s CES, LG, JBL and Lenovo all introduced new smart displays driven by the Google Assistant. Almost eight months later, the first of these devices, the uncreatively named Lenovo Smart Display, will be available for purchase this weekend. 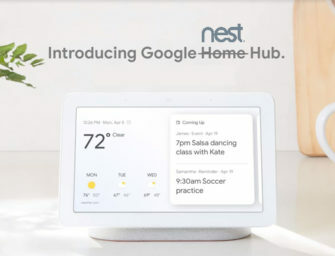 It is the first Google Assistant device in the smart display category. The Lenovo Smart Display is essentially a smart display with a speaker tacked on the end. The device will be available in two sizes: the 8-inch HD version for $199.99 and the 10-inch Full-HD version for $249.99, both featuring a full-range 10 watt speaker. If you have a YouTubeTV membership, you can enjoy live or recorded TV in your library hands-free. The next time you want to turn on the game, you can say “Hey Google, watch ESPN” to start streaming. Many other popular video services are supported too, including HBO Now, Google Play Movies & TV and Crackle. This catapults the Lenovo Smart Display from your standard smart speaker with a screen to essentially a mini-hands free TV with YouTube premium. Even without a premium version, the Lenovo Smart Display can become a hand-free demo assistant with YouTube, allowing users to find, play and pause tutorials on everything from home improvement to cooking. Without needing to touch a screen. Despite the Amazon Echo’s popularity, its smart displays like the Echo Show and Echo Spot have yet to resonate with consumers. The Voicebot Voice Commerce Consumer Adoption Report found that only 1.2% of US adults own either of these devices. For the Echo Show, the numbers are even lower, with only about 40% owning the Lenovo Smart Display category. The ability to access YouTube could change the slow adoption of smart displays and further increase Google Assistant’s growing market share in the US. Could YouTube be the game changing feature Google needs to overtake Amazon in the voice-first device market? When it comes to the smart display category in particular, the answer is very likely yes.